Any amount of physical activity is better than doing none at all. And if you are already physically active, increasing the amount you do can also benefit your health. By becoming more active, you are also playing your part in protecting our environment. Walking more will reduce your carbon footprint and benefit us all for generations to come. Encouraging others to join you will also help. How much physical activity do we need? It’s so easy to get active and here are loads of ways to get started – click through the links below and you’ll find a range of top tips and useful advice to help you. Just by moving more every day, you can help improve your physical and mental health. Combined with healthy eating and drinking, regular physical activity is one of the best ways to manage your weight. are living with a health condition or disability. Adults should aim to be active every day and achieve at least 150 minutes of moderate intensity activity over a week – or simply 30 minutes of moderate intensity activity most days (at least five days) each week. An activity is moderate intensity if your heart beats faster, you feel warmer and slightly out of breath, but can still carry on a conversation. Alternatively, adults may do 75 minutes of vigorous activity over the course of the week. For health benefits, activities should last 10 minutes or more – it all adds up! Activities should involve strength exercises on two or more days a week that work all the major muscles – legs, hips, back, abdomen, chest, shoulders and arms. Adults should also limit the amount of time they spend sitting or lying down (except when sleeping). Being physically active is really important for children. It builds strong bones, muscles and a healthy heart, helps develop social skills and encourages a sense of wellbeing. Children over the age of five years need to take part in moderate to vigorous intensity activities for at least 60 minutes, and up to several hours, every day. Again this can be broken up into small chunks of at least 10 minutes throughout the day – remember it all adds up! On three days a week, activities should involve exercises for strong muscles such as push-ups, and exercises for strong bones such as jumping and running. Children should also limit the amount of time they spend sitting or lying down (except when sleeping). There are loads of ways to be more active – many of them perfect for anyone who’s not been physically active for a while. Better still, you don’t have to join a gym to take part (‘green gyms’ are free and outdoor!). To help give you some inspiration, we’ve put together just a few ideas of some different activities to try out. 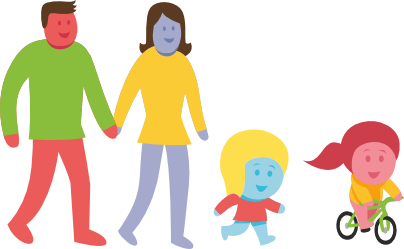 Many people enjoy being active as part of a pair a bigger group; so why not ask a family member or a friend to go walking, cycling, swimming... and get active together? Still one of the simplest and cheapest ways to introduce more activity into your daily life – but it needs to be a brisk walk. That means you are able to chat as you walk, but not be able to sing!. At that pace you are actually doing moderate intensity activity, so , your heart beats faster, you feel warmer and are slightly out of breath. In recent years, dancing has come roaring back into fashion with TV challenge shows putting it in the spotlight. Whether it’s traditional ballroom dancing or something more modern, taking to the dance floor is a great way to get the physical activity your body needs. Not to mention a great way to socialise. Swimming can be one of the most enjoyable ways to get more active, and it can be incredibly good for your sense of mental wellbeing too. there are public swimming pools in every part of Northern Ireland, so it’s a relatively easy form of physical activity for most of us to access. Swimming is a great activity to see your improvement – you may start off being able to do four or five widths or lengths and before long find yourself doing 10–15! If you can’t swim, why don’t you check out some lessons at your local pool? It’s never too late to learn. Take the plunge and get wet to get active! Cycling is growing in popularity all the time. No wonder. Not only is it a brilliant way to get out and about and explore your local area or head further afield, it’s also a fantastic way to get fit. Cycling is a great way to get active as a family, with a friend or to use a form of green transport going to and from work and the shops. 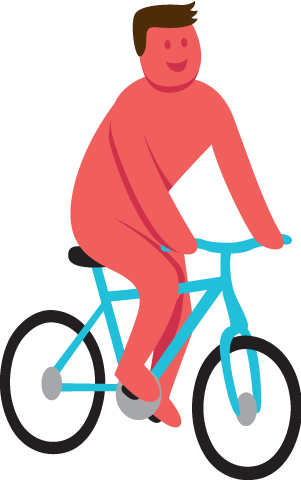 Many employers in Northern Ireland are involved in the Cycle to Work scheme so why don’t you check it out? You can discover loads of ways to get into cycling, from routes to try to clubs to join, at Cycle Northern Ireland. Northern Ireland has more than its fair share of outdoor spaces. Why not make the most of them and get your daily physical activity at the same time? A trip to a local park or somewhere further afield is a great way to stay active. Or maybe you have always wanted to try your hand at something new like kayaking, canoeing, archery or mountain climbing. This is your chance, so go on, take a friend, take the family, take the air! One great way to get active is by walking. It is one of the easiest ways to introduce more activity into your daily life – not to mention one of the cheapest. You can get a lot of health benefits by walking, eg helping to maintain a healthy weight and manage stress. But for walking to have a beneficial effect on your health, you need to do it briskly and, ideally, often. By fitting walking into your daily routine, you can increase your daily step count. Setting yourself a target of walking more steps a day can be a great way of increasing the amount of physical activity you do. 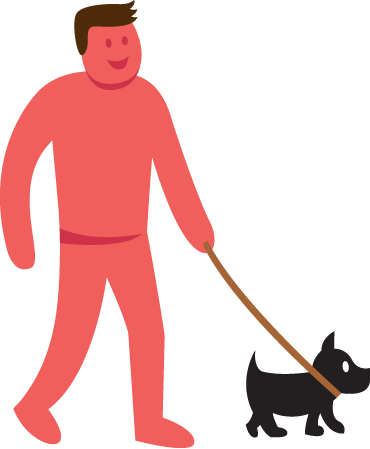 Walking briskly is classed as a moderate intensity activity. It counts towards your recommended 150 minutes of weekly exercise. What is a brisk walk? A brisk walk is when you are walking at a pace where you are still able to speak, but unable to sing! At that pace, your heart will be beating faster, providing many physical benefits. So we’re not just talking about a stroll across the car park or a saunter round the shops. The average person walks about 3,000–4,000 steps a day. It sounds a lot, but if you aim to gradually increase that to 10,000 steps a day, you’ll start to feel big health benefits. You can count how many steps you take using a pedometer or other wearable fitness tracker. A pedometer is a small device that detects hip movement. You can buy one for a few pounds from a pharmacist, sports shop or outdoor shop. You can also buy them in some supermarkets. You can also download a smartphone app, or your phone may already have one built in (many newer models have this), but you must remember to carry your phone with you all the time! Many other activities also count towards your daily steps. You can manually input your step count to weight-mate using the following table as a guide to how many you have done. 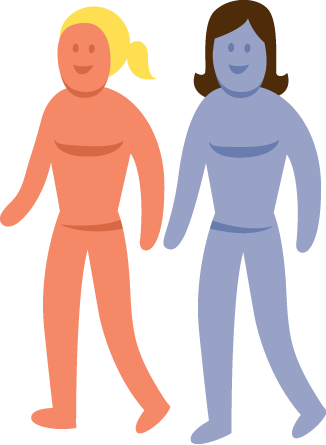 A step challenge can help people achieve their step target by working together as a group to support and motivate each other. Groups may be run by a local voluntary or community organisation, a workplace, or simply among friends and family. A group leaders’ guide and additional materials are available here. We all lead busy lives these days. Finding time to be active can be tough. But that’s the great thing about the walking bug. No expensive equipment, gear or track. All you need is a determination to get a brisk walk in at least once a day. From walking the dog or walking to the shops (instead of driving) to a weekend trip to discover some of the great natural walks Northern Ireland has to offer. Walking in a group is a great way to start walking, make new friends and stay motivated. Walking for Health group walks are aimed at people who do little or no physical activity but would like to become more active. If you feel ready to get back into physical activity or have already started and want more help and information, here are some great websites to take a look at, which may prove pretty useful on your path to a healthier ‘you’.